In Canada , most provinces observe Good Friday as a statutory holiday except for Quebec. In Ottawa basically everything was closed however across the river in Quebec , Les Promenades Gatineau was open. It has been recently renovated and with the opening of La Maison Simon’s in September 2015 it was worth the traffic congestion and crowds of shoppers from both Ontario and Quebec. 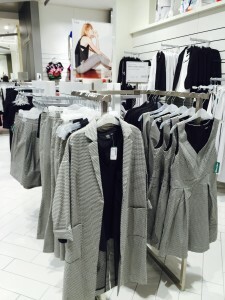 I love Simons and prior to the store opening in the National Capital Region , I would frequently visit the downtown Montreal store. Simons has been in business for 175 years starting in Quebec City as a dry goods store and now as described by Peter Simon, CEO and president of La Maison Simons a “uniquely different and inspiring fashion retailer” consisting of 12 stores. After dealing with the traffic gridlock and finding a parking space I sauntered into this beautiful contemporary store and immediately was happy. The displays, the merchandising and the garments were eye catching. Simons carries an assortment of home accessories, clothing, shoes, accessories for men and women. They also offer 3 exclusive labels and which are merchandised beautifully with the other lines they carry. For a customer you can mix and match and personalize your look and style by incorporating pieces from the Contemporaine or Icone lines and for the younger demographic with the Twik line. As a Image consultant I talk a great deal about wardrobe modules. Simply stated a wardrobe module consists of 9 pieces of clothing that all mix and match. Putting together these modules is a great way for people to save money and time and they work brilliantly for work and travel! 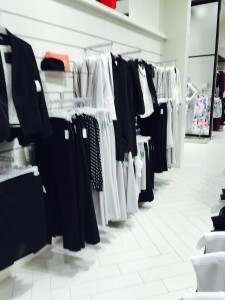 While sashaying through all the racks and displays on the women’s side it was abundantly clear that there were some fabulous pieces to create an entire wardrobe module or purchase a few pieces to incorporate into an existing wardrobe. What caught my attention immediately were the pieces in the Contemporaine line, which Simons describes as elegant, professional and dynamic. 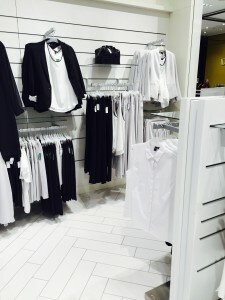 The colour story was done in heather grey and classic black ; however there were several other colours available (solids and prints) and style options from other lines and departments. What I particularly loved was the Contemporaine grouping in Heather grey. 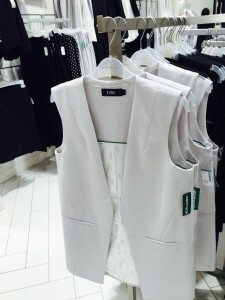 Dresses , skirts, blazers, pants and vest options mixed with the basic yet classic black dresses, pants, skirts, blazers etc you have a polished classic and stylish wardrobe to work with. The style lines had updated silhouettes which would be complimentary to many different body types. The sizes range form 2-14 and the fabric has a stretch weave ensuring a great fit. All Contemporaine pieces were priced below $150.00 with most in the $80 range, there were even a few pieces on sale. Despite having an online store www.simons.ca my suggestion is to go into the store as there are many more options available plus you can try them on. From my experience, personalized service is hard to fine ,yet the staff tend to be pleasant at the fitting rooms and when making a purchase. I am looking forward to Simons opening in the Rideau Centre this August!